The management and staff of Machangulo Beach Lodge take great pleasure in welcoming you to our beautiful home. We are delighted to host you and we would like to thank you for choosing us for your Mozambican adventures. We are here to make your stay a memorable experience so please don’t be shy, we’d love to hear from you. We wish you a wonderful stay here at Machangulo! Machangulo Beach Lodge uses this online, paperless portal to communicate with you, our valued guest, the ins and outs of your visit with us. Here you will find all the info you would expect from an in-room information folder. Please ensure that you tell the staff of any relevant medical information that we should be aware of so that we are properly prepared to assist. For any medical assistance or emergencies, please contact the management team with the in-room telephone on 100 or on the Whatsapp guest portal. In the unlikely event of an emergency requiring the evacuation of the lodge, a loud siren should sound continuously. Evacuations assembly points are on the beach, so make your way down there. Please familiarise yourself with the evacuation plan and assembly areas located behind the bathroom door. The Machangulo peninsula is home to many wildlife species and if you are lucky you will get to meet many of them. We also live with a troop of monkeys and several Genets. Although they might seem tame, they are not. Please do not feed them. Please treat all snakes, spiders and scorpions as venomous, even though few of them are. Please ensure that you are wearing protective clothing and sunscreen lotion at all times when enjoying the beautiful sunshine around the lodge. The first inhabitants of Mozambique were of the Khoisan people, who lived in harmony with the land, using wood, leather and stone weapons and implements. The Nguni people migrated southwards, starting perhaps as early as the 3rd century AD, from the north and west of Africa, crossing the Zambezi River valley basin, which was a major barrier, and down the coastal plain. They then gradually spread into the plateau and coastal areas of South Eastern Africa. Mozambique had an established Arab presence by the 10th century evidenced by the first written record of Mozambique by an Arab writer, Al-Mas’udi, when he mentioned the town of Sofala, – 45 km south of Beira. Coastal trade was at first dominated by Arabs and Persians, hence the proliferation of Dhows, a traditionally Arab style of vessel. For several centuries, Arab commercial and slave trading had existed along the coast and outlying islands. The Arabs traded mainly ceramic pottery, cloth, glass, beads, salt and metal goods with these Bantu-speaking people in exchange for gold, palm oil, rhino horn, amber, hides, skins and ivory. With the cooperation of the African chiefs, this trade expanded, supplied by goods from the kingdoms in the interior hinterland. In time intermarriage between these two groups gave rise to the Swahili culture which is still dominant in the Eastern African coastal areas and stretches down to northern Mozambique. One of the oldest and most southerly of these trading groups, was a settlement called Mapungubwe. It is thought to have started during the 10th century in the upper reaches of the Limpopo River, based on groups of villages under a chief, known as the “Nyika system”. It is the earliest known settlement featuring stone enclosures, or “Zimbabwes”. The first European to reach Mozambique was Vasco da Gama after he had rounded the Southern tip of Africa in 1498 in his attempt to open a trade route from Europe to India. After conquering the Arab trading settlement, Portugal became the dominant trading power of the East Coast of Africa, monopolising the Indian Ocean trading routes for two centuries until they were defeated by the Omani Arabs at the end of the 17th century. The Portuguese made Mozambique Island their headquarters in 1897 located in the far north of Mozambique. The headquarters were eventually moved to Delagoa Bay, which became Lourenço Marques and now Maputo.Portuguese power declined during the period when the crown of Portugal was combined with the crown of Spain (1580-1640). The Portuguese African coastal settlements were ignored and fell into a poorly maintained condition. This resulted in investment lagging while Lisbon devoted itself to the more lucrative trade with India and the Far East as well as the colonisation of Brazil. At the Berlin Conference in 1884, Mozambique became a Portuguese Colony, this resulted in a system of dividing the land into prazos (large agricultural estates). This system resulted in land being rented to British and French companies, which set up plantations growing cash crops such as cotton, and tea. The result was that the local inhabitants cultivated the land for the benefit of the European leaseholders (Prazeros), who were also tax-collectors for each district and claimed the tax either in labour or produce. This system kept the sharecropping farmers in a state of serfdom. Direct Portuguese influence was limited mainly to the coast between several sea ports and Madagascar, where a large trade in slaves was carried on until 1877, supplying slaves for Arabia and the Ottomans. European traders and prospectors barely penetrated the interior regions, until the Transvaal gold rush in 1886. The 1917 Shona Rebellion was Mozambique’s first major anti-colonial uprising. Many of the Portuguese military bases were overrun and it took 3 years for the authorities to restore order in Mozambique. Reforms which were long overdue were implemented in 1926 under a new dispensation in Portugal known as “Estado Novo” (New State). After World War II, many European nations were granting independence to their colonies. Portugal however established Mozambique, Guinea-Bissau and Angola as Portuguese overseas provinces of the mother country, and emigration to the colonies soared. Mozambique’s Portuguese population at the time of independence was about 250,000. Neither Portuguese citizens nor indigenous Mozambicans (Indigenas) had political rights, although Portuguese citizens were in a privileged class of their own. Indigenas who were indigenous Mozambique citizens could, by fulfilling certain provisions, become an “Assimilado”. This meant that they could become a Portuguese citizen. One of the main conditions to be met was proper education. Educational opportunities in Mozambique were limited so there were not many Indigenas who became Assimilados. The aspirations of the Black Mozambicans to rule themselves without having to become “Black Europeans” was not met, causing increasing dissatisfaction. The desire for Mozambican independence gained pace, and in 1962 an assortment of anti-colonial political groups, under the leadership of Dr Eduardo Mondlane (educated in America) formed the “Frente de Libertacao de Mozambique” (FRELIMO) on 25 June 1962. Frelimo, based in Tanzania, began an armed campaign against Portuguese colonial rule in September 1964 and was soon in control of large parts of Northern Mozambique.In 1964 Mondlane was killed by a letter bomb in his offices in Dares Salaam and in February 1969 Samora Machel took over as leader of FRELIMO. Ongoing guerilla wars began sapping Portugal’s ability to maintain these costly wars. Following the 1974 coup in Lisbon, a military junta was established under Gen. Antonio de Spinola resulting in the collapse of Portuguese colonialism. This resulted in a peace agreement in Mozambique on 7 September 1974 and the installation of a provisional government leading to the establishment of the People’s Republic of Mozambique shortly thereafter. The new government, under president Samora Machel, established a one-party state based on Marxist principles. The new government received diplomatic and some military support from Cuba and the Soviet Union and proceeded to crack down on opposition. Starting shortly after independence, the country was plagued by a long and violent civil war between the opposition forces of anti-Communist RENAMO rebel militias and the Marxist FRELIMO regime. This conflict, combined with sabotage from the neighbouring white-ruled state of Rhodesia and the Apartheid regime of South Africa, ineffective policies, failed central planning and the resulting economic collapse; characterized the first decades of Mozambican independence. This period was also marked by the exodus of Portuguese nationals and Mozambicans of Portuguese heritage, a collapsed infrastructure, lack of investment in productive assets, and government nationalisation of privately owned industries, as well as widespread famine. During most of the civil war, the FRELIMO-formed central government was unable to exercise effective control outside of urban areas, many of which were cut off from the capital. It is reported that in RENAMO controlled areas, which included up to 50% of the rural areas in several provinces, health services of any kind were isolated from assistance for years. The problem worsened when the government cut back spending on health care. During the war RENAMO proposed a peace agreement based on the secession of RENAMO controlled northern and western territories as the independent Republic of Rombesia, but FRELIMO refused wanting sovereignty over the entire country. An estimated one million Mozambicans perished during the civil war, 1.7 million took refuge in neighbouring states, and several million more were internally displaced. The FRELIMO regime also gave shelter and support to anti-goverment movements while the governments of first Rhodesia and later South Africa (at that time still operating under Apartheid laws) backed RENAMO in the civil war. President Samora Machel conceded the failure of socialism during the third FRELIMO party congress in 1983, as well as the urgent need for major political and economic reforms. This he set out to attempt but on the 19th of October 1986, Machel was killed, with some advisers, in a suspicious plane crash, close to the Mozambique border inside South Africa. Joaquim Chissano became president in his place. The collapse of the Soviet Union, Frelimo’s strongest ally, as well as the lifting of the ban on the ANC in South Africa led to peace talks being resumed in Mozambique in 1991.This resulted in an adoption of a new constitution and the beginning of peace negotiations between FRELIMO and RENAMO and the ending of one party rule in Mozambique in 1990. The word “People’s” was eliminated from the country’s name and, after holding its first multiparty elections in 1994, Mozambique started on a long programme of recovery of its economy and infrastructure. The country’s economy is based largely on agriculture, but with industry growing – mainly food and beverages, chemical manufacturing, aluminum and petroleum production. South Africa is Mozambique’s main trading partner and source of foreign direct investment. Portugal, Spain and Belgium are also among the country’s most important economic partners. Since 2001, Mozambique’s annual average GDP growth has been among the world’s highest. However, the country ranks among the lowest in GDP per capita, human development, measures of equality, and average life expectancy. There are 17 languages spoken in Mozambique, the primary ones in the south being Shangaan, Tswa and Ronga. Portuguese is the official language and most widely understood. Click on the points to find out more . . .
Our team of over 50 individuals are here to ensure you have a remarkable stay in Mozambique, here are the leaders of the teams. . .
Dear guest, thank you for visiting us here in Mozambique. My name is Alfredo Sousa and I am here to ensure your every need is taken care off. Please contact me on the WhatsApp portal or on extension 100 if you need me. I joined Machangulo in November 2016 and I hope to spend a lot of time with you during your stay. Hi my name is Siffiso and I started as a waiter here at Machangulo Beach Lodge. I am now the Guest Coordinator and I will be ensuring that the activities and service teams know your every desire. Please talk to me if you need anything, I am here to make your stay comfortable and friendly. My name is Keith and am a qualified guide in profession, I am here to give you a wonderful guest experience at Machangulo in all of our water and land based activities we offer, together with my team I look forward to welcoming you and assisting you during the course of your stay! I have worked at Machangulo since the building phase in 2008 and was employed in the beginning as a waiter in 2011. After 6 years of being a waiter I am now responsible for the stores and human resources of the lodge and hope to meet you during your stay. Bem vindos a Machangulo! My name is Jacques van Eck and I am here to ensure everything at the lodge works at optimum performance. Please contact me on the WhatsApp portal or on extension 100 if you need me. My name is Jesca and have been with the Machangulo team since 2018. I work with a team of locally employed cooks and together we will ensure your food needs are well taken care of during your time staying with us at Machangulo. Our food and beverage experience focuses on local cuisines with fresh ingredients that showcase Southern Mozambique’s unique flair. Fresh seafood is our speciality and we highly recommend that you give it a try. We have a wide variety of abilities in the kitchen and we would like to showcase these to you. Should you feel that our portions are too large or small for your liking, please do not hesitate to let the staff know, they would like to get it just perfect for you. We would like to ensure that you enjoy your meals – as we have a wide variety of expectations here at Machangulo we invite you to communicate your culinary expectations with our service staff. Please ensure that we aware of any allergies. Continental buffet with ordered hot breakfast. The menu is available from your waiter. Generally at Baixas bar. Packed lunches are also available, please tell your waiter if this works for you. Your waiter will offer you some lunch options during breakfast. He will also confirm a time and place for you. Packed lunches are a great option for activities. Your waiter will offer you some dinner options during lunch. Starters generally include a soup or salad choice. Three options for dinner will be presented, including a seafood choice, a chicken or red meat option and a vegetarian option. The chef will surprise you with a delightful dessert after your main course. You are more than welcome to ask any staff members if you require an additional meal or snack, we are always able to help, even if it takes a bit of time. During pre-dinner drinks, we will have a snack at the Delagoa lounge, for you to enjoy with your drinks. We have some unique experiences and locations for special events and would like to invite you to tell us about any events, anniversaries, birthdays or special occasion – we’d like to create something special for you. Machangulo Beach Lodge features two unique bars and a variety of options to quench every thirst. From 5 pm onwards. Should you require service outside these hours, please request this from our service staff, they are happy to assist. Great place to enjoy drinks before and after dinner, with a spectacular view and deck. Baixas bar is at the Baixas(meaning “lower” in Portuguese) complex. Great for all your daytime drinks and cocktails. From here we also service the beach and the viewpoints. Here at Machangulo, we do not have a set wine list perse – Owner Christiaan Nolte, a wine lover, selects rare and exclusive wines on a continual basis, always ensuring some uniques options. There is a wine display case in the Delagoa lounge that has a selection of what is available on show. Please talk to your waiter if you require any additional information. All rooms have drinking water provided in jugs and glass bottles. This water is clean and filtered and replenished daily. Please let us know should you need additional water. Plastic bottled water is available but we request you to please take the environment into consideration, plastic comes with a heavy burden on the environment. We do charge for plastic bottled water. At the breakfast buffet and Baixas bar you will find water dispensers all day, should you need to fill your bottle. Additionally please ask a member of staff to provide you with some additional water. Your room has a fully stocked minibar that is restocked every day. Soft drinks are $2.50, liquor miniatures are $5 and wine (red and white) $6 each. Your room is equipped with a tea and coffee station, please feel free to help yourself. Our service team will gladly prepare a cooler box with some drinks for you, you will be charged for only those drinks that you use. Please ask any waiter should you require a cooler box. Tea and coffee are always complimentary and available all day. During meals simply ask your waiter. Both bars will be able to help you during the rest of the day. At the breakfast buffet and Baixas bar you will find some juice available all day, please feel free to help yourself or ask a waiter for some. This is a complimentary service. Most of our staff have a good command of English, but it is at best a third or fourth language to them so please keep that in mind. We also speak Afrikaans, Portuguese and Shangane. Some members of our staff are still in the developing stages of the new language they have been introduced to, so should you find yourself lost in translation please inform the management team so that we can help. African Kikois, a staple here in Mozambique serve us well as beach towels. They are friendly to the environment and easy on the eye! They are also for sale from the office as they make an excellent travel companion. They are available in your rooms with the beach basket – you are welcome to ask any housekeeping staff or the manager to replace your towel for you at any time. You could also leave it on the floor in your bathroom to be replaced. Please consider the environment when doing so. There are several ways to enjoy the pristine beaches around the lodge. Walking, swimming and just lounging around. The thatch(called majeka) umbrellas are available to all our guests and a waiter will ensure that you remain well hydrated while enjoying some sunshine. Machangulo Beach Lodge is surrounded by world-class swimming beaches. Most beaches are entirely safe for swimming and can be enjoyed for most of the day. The topography of the channel in front of the lodge leads to strong currents during spring tides and we ask that our guests take special care of the conditions. We suggest that our guests avoid swimming on an outgoing tide in the channel. Swimming at night is also not recommended. No lifeguards are on duty. Parents or guardians need to accompany children at all times when swimming. If you are unsure of the conditions, feel free to ask the management team. The beaches on Inhaca island are “swimmable” more often, as are the beaches on the open ocean side of the lodge, so go for it or let us know if you’d like a lift to Inhaca. We also urge you to make use of high protection sunscreen and sun protective clothing to avoid sunburn and sunstroke. Unfortunately plastic is a major problem worldwide although we try very hard to clean the beaches, there is a constant flow of plastic being dumped on the beaches around the lodge, please take care not to step on any sharp pieces and lend a helping hand to mother nature by picking up any plastic you find lying around. Bins are provided everywhere through our community garbage initiative KA KU Basa. Please note that Mozambican law strictly prohibits smoking in public areas, however, you are more than welcome to smoke outside. Due to the high fire risk, we ask that you make use of the ashtrays provided. We kindly ask that you never flick cigarettes into the bush, please! Wireless internet is available throughout the lodge and rooms please connect to the “Machangulo_guest” WIFI. Wi-Fi is free to all our guests. Even though the line is capable of handling all our guests, we ask that you avoid updating software and downloading large files like movies, please. Mobile reception can be limited in certain parts of the lodge. Should you need assistance connecting, please let us know. Our telephone network is connected to all rooms and most public areas, please feel free to contact our staff with it. The office is manned from 7:00 to 21:00. Any after-hours calls will be charged at $50 unless in an emergency situation. The phone system is unable to make outside calls, it is for local use only. Check out these great links for more information on the weather situation. The Dune Walking Trail is easily accessible from the lodge that will give you magnificent views of the beach and the lodge. The trail starts at Vista Mar. On the dunes you will immediately notice the shade cloth barriers. Machangulo Beach Lodge is working very hard to rehabilitate the storm damaged dune to our south, these barriers are designed to protect plants from the wind and we hope to re-establish the lush forests on the dunes. There are many other beaches, dunes and forests to explore in the area. Please chat to the activities staff should you require any information. This is a great opportunity to experience local living by visiting the small village of Santa Maria. Almost all of the staff here at the lodge are from Santa Maria. Machangulo Beach Lodge is committed to the improvement of the quality of life of our local community and the stimulation of local business. We work closely with our staff members in the community and we would love for you to visit Santa Maria and show your support too. Lunch and purchases at Santa Maria Village are best done in Meticais. We also suggest that you enjoy a scrumptious lunch at Bemugi’s Place, a great restaurant run by our longtime manager, Bemugi Shoshaka. The restaurant is on the way to Santa Maria and can be a stop on the way to or back from town. Inhaca Island provides a wide array of activities to choose from. This delightful island is home to only one village, aptly named Inhaca Village where many shops and restaurants can be found. The island has more of a tourist feel to it and has more people than the Machangulo Area. Trips to the island are organised with third parties that operate there but a member of the Machangulo Team will accompany all activities to the Island. Take the boat from Machangulo Beach Lodge to the Inhaca Village. The boat journey takes about 20 minutes and is well sheltered from the waves. Take a stroll on the beach to the village with your guide and explore the areas. The village is home to many little shops, a little market and Lucas’s Restaurant, a great place to enjoy local food and drink. (Please remember to take cash in Meticais for this). USD 50 pp, Minimum of 2 persons, 2 hours. This tiny deserted island is located to the north of Inhaca Island. These beaches are beautiful and quiet and the perfect place to relax and have a picnic. USD 15 per person/Minimum of 2 persons, 2 hours. Railway Station; Central Market; Municipal Town Building; Samora Machel Memorials; Iron House; Natural History Museum; Fort; Polana Hotel; The Saturday Bazaar or Arts & Crafts Fair (Saturdays only). This tour is usually arranged upon your departure from the lodge, weather and tide dependent. These tours are often best to do before check in or after you check out from Machangulo Beach Lodge. It is an excellent way to spend a couple of hours while waiting for a boat or a flight. USD 70 per person. Please enquire about availability, booking is essential. The reserve is 77,400 hectares (191,000 acres) in extent and was originally proclaimed in 1932. The reserve will eventually form part of the Lubombo Transfrontier Conservation Area, which includes national parks from South Africa, Mozambique and Swaziland. At the moment it forms part of the Usuthu-Tembe-Futi Transfrontier Conservation Area. The park is home to 350 African Elephants, birds (Kingfisher, Fish Eagle and many more), zebra (if you are lucky), large and small antelope, Nile Crocodile and Hippopotamus. You will be transported to the 4×4 at the PontaTorres Parking area where Bemugi one of the representatives of the lodge will take you to the Maputo Special Elephant Reserve. A packed lunch and drinks are provided, please be sure the activities staff knows what your preferences are. Rates are USD 200 per person for a minimum of 2 guests and a maximum of 4 guests. (Full day excursion – duration 7 to 8 hours) USD 200 per person, minimum of 2 persons maximum 4 persons. The estuaries and bay between Inhaca Island and Santa Maria Village provide endless hours of fun and exploration. Take a kayak to discover the mangrove forests or go searching for amazing photographic opportunities. The choice is yours. From birdlife and turtles to flying fish and local sailing boats. The bay is an amazing eco system, teeming with life. Rates are USD 35 per person, minimum 2 persons for 2 hours. The estuaries and bay between Inhaca Island and Santa Maria Village can also be explored by Dhow. A romantic sail around the bay with a traditional hand built wooden Dhow. Machangulo Beach Lodge is situated in the midst of many world class fishing locations. The area provides opportunities to target a large number of species. Machangulo Beach Lodge’s long time manager now operates his own fishing carter business in the area and we support Bemugi in his new endeavor. As such our fishing trips are booked with Bemugi’s fishing carters and is subject to availability and weather. Please let our staff know if you’re like to go fishing so they can make the arrangements with Bemugi. All tackle and equipment is included and the payment for this activity can be included on you bill here at the lodge. Full day (6 hours USD 600) and Half Day (4 Hours USD 400). Minimum of 1 person, maximum of 6 persons. Minimum of 4 hours. 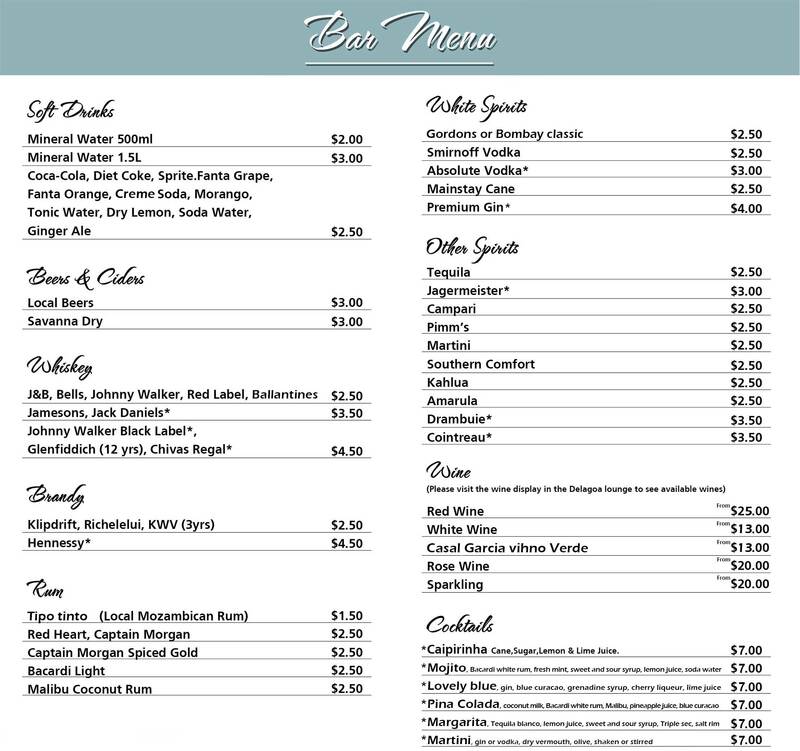 The lodge will pack your food and drinks, be sure to let us know what you prefer to drink during your trip. Please note that all lost or broken tackle will be charged for. The Marine reserves surrounding the Machangulo Peninsula provides some excellent diving. Off the beaten track diving at its best. With ample options for advanced divers, it is the ideal location for those looking for a unique and unexplored diving experience. For the complete novice, we offer a full selection of diving courses. Here are some highlights of what we offer. Refresher – (Suggested if you haven’t dived within the last 6 months but compulsory if you haven’t been diving in the last 12 months) USD 50 Per Person. This short course covers a quick test of basic dive theory allowing you to feel proficient in the use of recreational dive tables, emergency procedures, proper pre-dive checks and ascent/descent procedures, underwater communications, and the theory behind equalization and buoyancy. After completion of the theory, it is into the pool to practice equipment set up and disassembly, alternate air source use, controlled emergency swimming ascents, low-pressure inflator detachment and oral inflation, buddy checks, ascent and descent procedures, compass use and navigation. While not an actual SCUBA certification, during the Discover SCUBA Diving experience you’ll learn how to use SCUBA equipment in shallow water and get a quick and easy introduction to what it takes to explore the underwater world. The course typically takes half a day, including theory, pool session and an open water SCUBA dive (which will count towards a SCUBA Diver or Open Water Diver certification in the reserve). USD 100 Per Person. This 4-5 day course is the world’s most popular SCUBA course, and consists of three main phases: Knowledge Development to understand basic principles of SCUBA diving, Confined Water Dives to learn basic scuba skills, and Open Water Dives to review your skills and explore! If you’ve tried diving through a Discover SCUBA Diving experience, the skills you learned may be credited towards a portion of the full PADI Open Water Diver course certification. Upon completion, you will receive full PADI Open Water Diver certification. USD 550 Per Person. The Advanced Open Water Diver course helps you increase your confidence and build your SCUBA skills so you can become more comfortable in the water. This is a great way to get more dives under your belt while continuing to learn under the supervision of our PADI Instructor. This course builds on what you’ve learned and develops new capabilities. You will complete five adventure dives that introduce you to: underwater navigation, deeper water diving (typically anywhere from 18-30 metres/ 60-100 feet), boat diving, drift diving, AWARE – Fish Identification, underwater naturalist. Each Adventure Dive in the PADI Advanced Open Water Diver course may credit toward the first dive of the corresponding PADI Specialty Diver course. In order to complete this course, you must be a PADI Open Water Diver (or have a qualifying certification from another training organization). USD 300 Per Person. If you are an up-to-date diver and have your relevant qualifications with you, we have several different dive sites that can be visited while you are staying with us. Diving in the marine reserve is a wonderful dive, with depths not exceeding 12 meters. Situated in the Inhaca Marine Reserve, there are beautiful juvenile reef fish and a turtle or two residents there, as well as schools of larger predatory fish that move into the area on the incoming tides. Rate includes Marine reserve fees. Situated behind the surf-line from the point, this dive ranges from 3.5 meters to 6 meters. There are lots of coral blocks, humpback snappers, electric rays, and sometimes even eagle rays. Average time: 2 hours – Advanced Open Water Divers only. This reef has a large cave with spotted snappers inside it. There is also a good chance of seeing some sharks. This is a deeper dive with depths down to 30 meters. Average time: 3 hours. This dive will give you a good opportunity to see lots of green turtles, some ragged tooth sharks, large schools of fusiliers and trigger fish. A vast reef with amazing coral life. Great option for a double dive. Graham’s Spot – USD 80 pp Average time: 2 hours. This reef gives you a great chance of seeing large schools of spotted grunters, fusiliers and surgeon fish. There are other reefs that are accessible from time to time and can be discussed with the diving staff. FYI – Baixa means “lower” in Portuguese and is the word used for REEF. So Baixa Santa Maria = Santa Maria Reef. . .
Upgrade any dive to a double tanker and add 25USD per dive to your dive. All dives courses are subject to availability to be booked at least 2 weeks prior to arrival. All water based activities are subject to tidal and weather conditions and are only presented at the discretion of the Dive Master or Lodge Manager. Inhaca Island Snorkelling. Our most popular activity! The Inhaca Island Marine reserve has 2 km of pristine snorkelling along the bay side of the Inhaca point(Ponta Torres). The Inhaca Island Marine reserve has 2 km of pristine snorkelling and the Picnic Snorkel on the island is HIGHLY recommended, one of our favourite activities. Machangulo Beach Lodge’s Spa offers a great selection of relaxing treatments that will leave you feeling rejuvenated and relaxed. A wide variety of massages, wraps, skin care treatments and more. Please see our Spa Menu or have a chat to our Spa therapist for more information. Choose your secluded spot on Machangulo beach for a unique picnic experience. Picnics by boat can be arranged to Inhaca Island and Portuguese Island. Chat with the activities staff to set up your shaded picnic area wherever you choose. Beautiful view, great treatments – come in and relax! Please share your experience with us by clicking on the link below.